Shashlik is a takeaway and restaurant classic that never fails to please. I have made this recipe easier to file at home by cooking the paneer in a large roasting dish to save time however if you want to thread the paneer and vegetables on skewers then it will work just as well. You can also use chicken for this recipe if you prefer but if you’re not familiar with paneer then now is your chance to try it. Paneer is a firm cottage style cheese which loves spice! 1. Plan ahead so you have plenty of time for the marinade to work its magic with the paneer. Start off by cutting the paneer blocks into large, even chunks. Make the spice mix by combining all the spices and stir through the yogurt. Toss the paneer chunks and vegetables in the marinade, cover the bowl and chill for at least 2 hours but overnight if you can. 2. When you’re ready to cook, preheat the oven to 200c/ 170fan. Take a large roasting tray and add the paneer mixture and give a good squeeze of lemon over the top to bring the flavours alive. 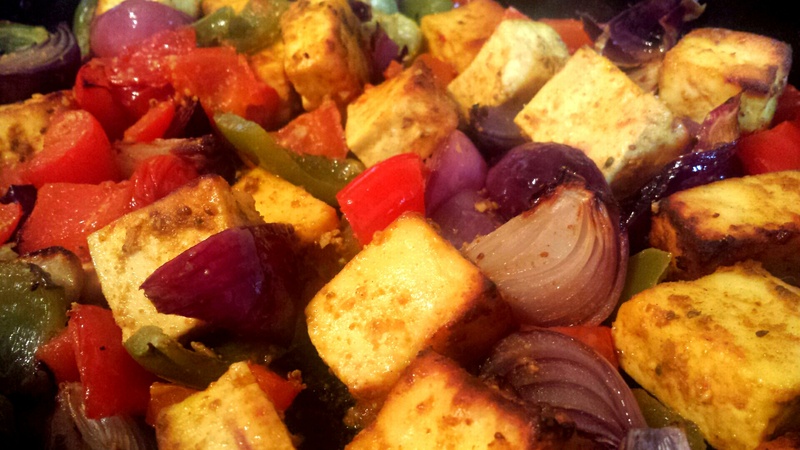 Cook for around half an hour until the paneer is golden and vegetables are tender. Give the tray a jiggle halfway through cooking. Serve with beads such as paratha or chapatis. Shashlik style paneer- a simple twist on a classic that’ll wake up your tastebuds!